The WorkStar® 1000 is a professional, commercial grade, USB rechargeable "slim" LED work light that produces 600/260 lumens, runs for 2/5.5 hours and is competitively priced. 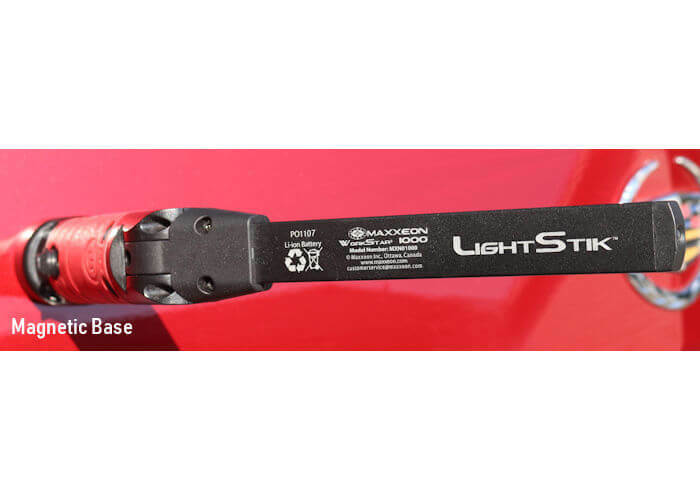 The Maxxeon LightStik WorkStar® 1000 Technician's Professional LED Work Light is a handheld, cordless, Li-ion rechargeable "slim" light. It features a long, narrow light bar that can fit into hard to reach places. 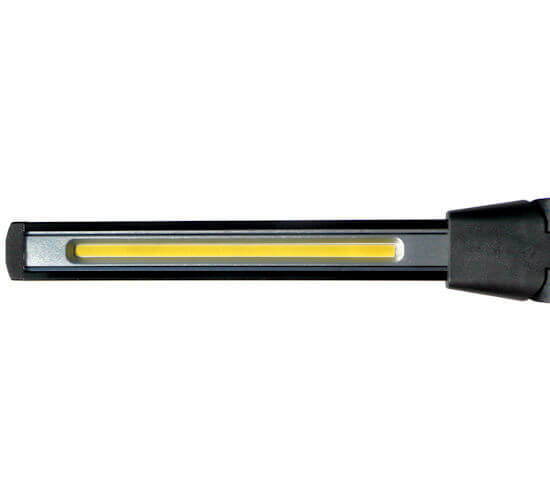 The light bar is a powerful 600 lumen wide beam COB LED, plus there is a handy narrow beam penlight LED on the end of the light bar that can easily illuminate those really hard to reach black holes. Battery Indicator: Like its big brothers in the LUMENATOR® series, the Technician's Work Light features an innovative battery indicator that works both during charging and while the light is operating. Three green LEDs are arranged in a bar graph format, so the status of the battery is never a mystery. 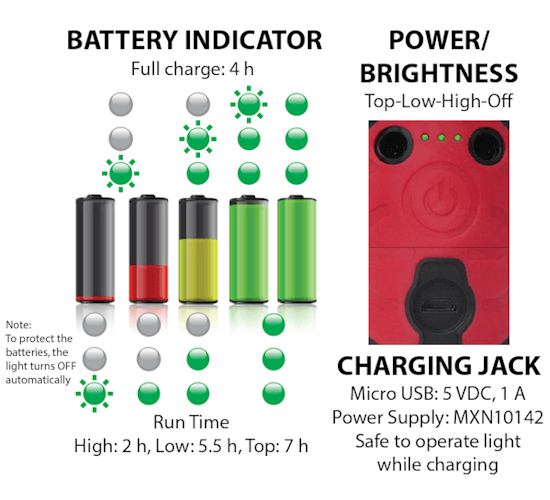 Charging: The WorkStar® 1000's 18650 Li-ion battery is charged via a micro USB jack, so it can be charged in a vehicle or anywhere there is a USB port. 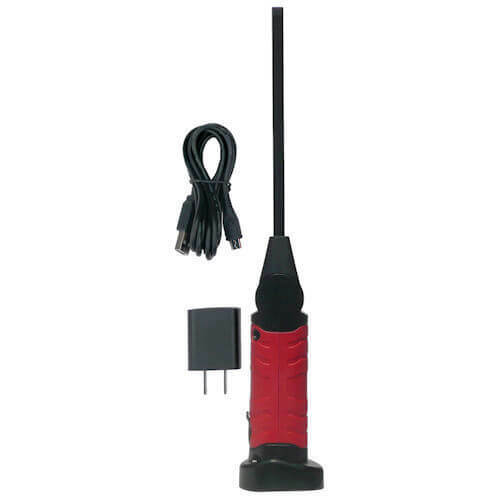 A small wall plug with USB output is included. The battery should last for many years in normal operation. Top Light: The 3 W Cree LED on the end of the light bar produces 120 lm and has a run time of 7 hours. The LED color is daylight white at about 5800K with CRI>65. The beam ratio is 1.5:1, which is a narrow beam. Just like the main beam, this bonus light creates very consistent beam over the entire beam diameter. 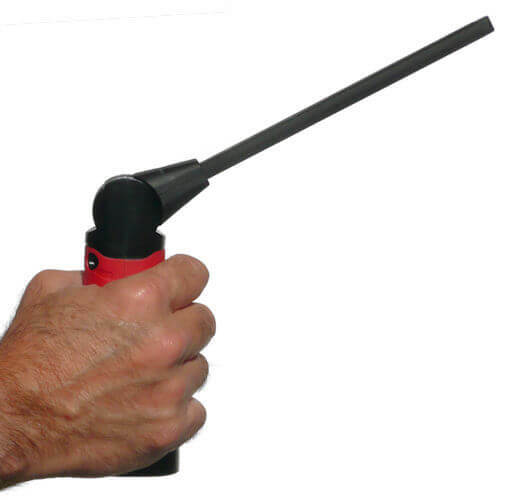 The LightStik's body is made from ABS and has soft rubber coating that provides a secure grip. The 2 main features of the body are the tilting head and the magnetic base. 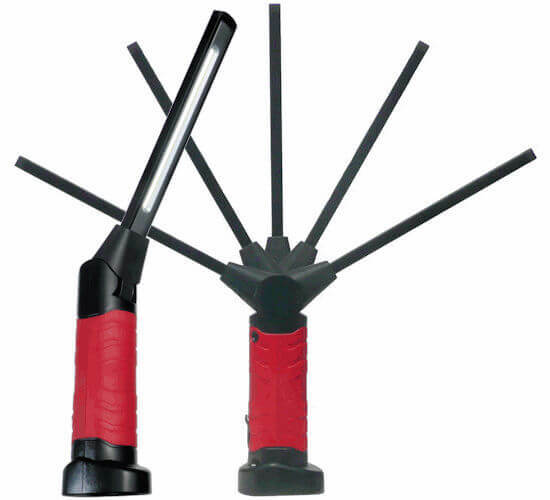 The LightStik head tilts 120 degrees with 5 indented positions, so the 2 lights can be aimed in any direction. The powerful, rubber covered magnetic base works in conjunction with the tilting head and the very wide beam to provide superior hands-free operation. Unlike some of the competition, the base is very wide and stable, so even when the LED work light is not stuck to a ferrous surface, the light won't tip over when the head is tilted. It's only 13 in long and weighs less than a pound. With an IP54 rating it is water resistant to water jets and rain. With an IK07 impact test and 6 ft drop test ratings, it is a dependable, professional tool. For many situations in HVAC and Automotive, the Maxxeon LightStik WorkStar® 1000 is the perfect LED Work Light. 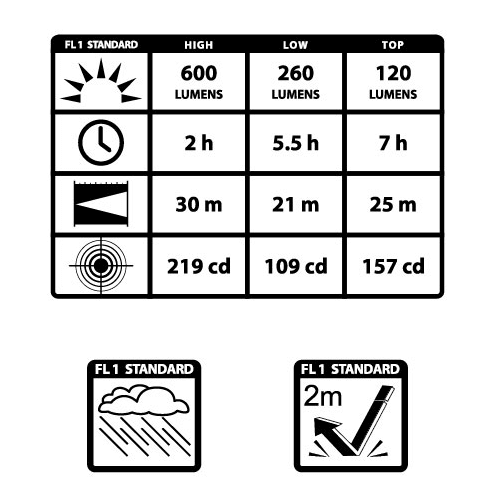 Main Beam Ratio Lens creates an wide floodlight beam - no rings, no shadows, no hot spots. The beam diameter to distance ratio is 3:1, for example, the beam diameter is 6 ft wide when the light is 2 ft from an object. 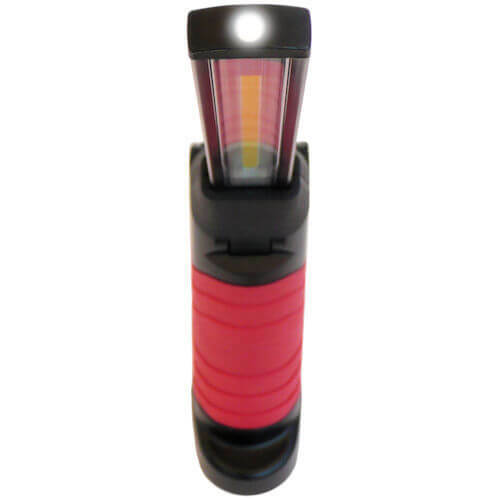 Top Beam Ratio Lens creates an narrow penlight beam - no rings, no shadows, no hot spots. The beam diameter to distance ratio is about 1.5:1, for example, the beam diameter is 3 ft wide when the light is 2 ft from an object. USB Power Supply/Charger Input: 100-220 VAC 50/60 Hz UL-Approved North American power supply with standard "Type A", two prong plug. Output: 5 V, 1.5 A USB jack. Founded in 2003, Maxxeon Inc. is a leader in the design, manufacturing and marketing of portable task lighting for professional automotive and industrial technicians. Our products include a growing range of high performance, cordless LED lighting tools for use in repair and maintenance shops, HVAC and inspection applications, and outdoor activities, such as hunting and camping. Using advanced research and development techniques, combined with state-of-the-art technology, Maxxeon Inc. endeavors to be the leader in the innovative design, marketing, sales and distribution of LED work lights.